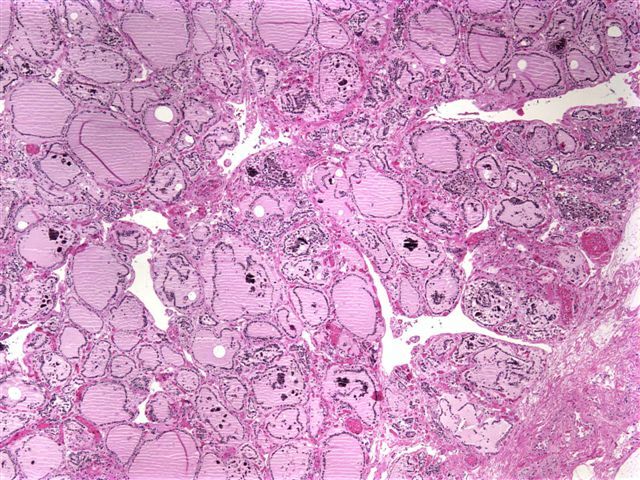 We thank Dr. Julia Braza, Beth Israel Deaconess Medical Center, Boston, Massachusetts (USA), for contributing this case.� To contribute a Case of the Week, please email info@PathologyOutlines.com with the clinical history, your diagnosis and microscopic images in JPG, GIF or TIFF format (send as attachments, any size, we will shrink if necessary).� Please include any other images (gross, immunostains, etc.) that may be helpful or interesting.� We will write the discussion (unless you want to), list you as the contributor, and send you a check for $35 (US dollars) for your time after we send out the case.� Please only send cases with a definitive diagnosis, and preferably cases that are out of the ordinary. Black thyroid due to pigment deposition is a well known side effect of minocycline (tetracycline) treatment.� Pigment may also be deposited in bone and oral mucosa (Oral Surg Oral Med Oral Pathol Oral Radiol Endod 2004;97:718), and a similar effect from doxycycline has been reported (Head Neck 2006;28:373). 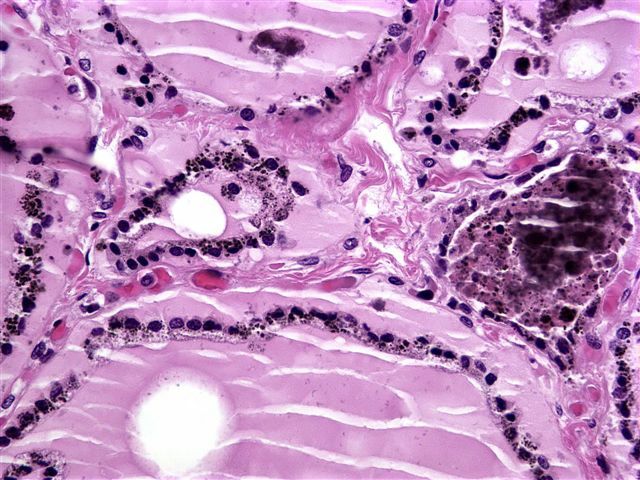 The pigment may be within thyroid epithelium, colloid or macrophages.� Its exact nature is controversial.� It stains with Fontana-Masson, resembling melanin.� It has also been characterized as lipofuscin (AJCP 1983;79:738, Hum Path 1985;16:72), which may be an oxidative product of minocycline, due to its competitive inhibition with thyroid peroxidase. 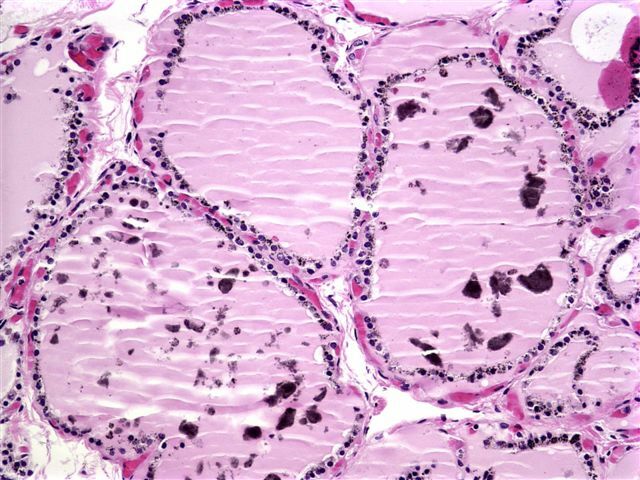 Black thyroid may also be due to doxepin, lithium carbonate or tricyclic antidepressants.� In these patients, the pigment is thought to be due to lysosomal accumulation of drug, not oxidation (Archives 2004;128:355). 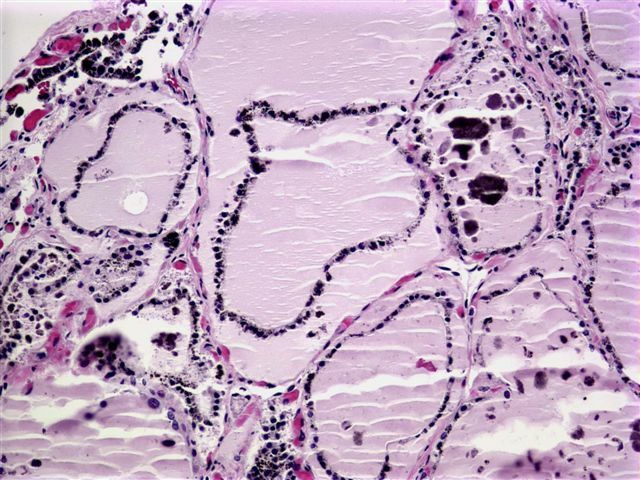 Many reports have suggested that black thyroid is associated with thyroid pathology, but no clear relationship has yet been established.� However, as papillary thyroid carcinoma in black thyroid is often unpigmented, hypopigmented foci should be thoroughly examined (Mod Path 1999;12:1181). Despite the striking histologic findings, no specific cytologic findings have been described after fine needle aspiration (Diagn Cytopathol 2006;34:106).